High Occupancy Vehicle (“HOV”) lane, better known as a carpool lane, is a restricted lane to be used by drivers with passengers during peak hours. 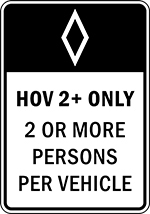 In most parts of Washington the restricted access or HOV lane is reserved for 2 or more occupants. In some areas, however, they require 3 or more occupants. One of the myths surrounding HOV/Carpool lanes in Washington State is that drivers are allowed to briefly use the HOV/Carpool lane to pass slowing-moving vehicles. That is not true. With the constant people merging in and out, and the sudden changes in speed with traffic, carpool lanes are a common site of car accidents. If you are in a car crash in a carpool lane, you need a personal injury lawyer in Spokane on your side. Our experienced and knowledgeable attorneys at Parke Gordon Law Firm will work hard to get you the compensation you deserve. Contact the law office of personal injury attorney Mat Parke today for a free consultation. This is your opportunity to speak with an experienced personal injury attorney about your case for free. Call (509)482-7274 to get started on receiving a fair settlement from your personal injury case. No person shall drive a vehicle onto or from any limited access roadway except at such entrances and exits as are established by public authority. RCW 46.61.160: Restrictions on limited-access highway—Use by bicyclists. The department of transportation may by order, and local authorities may by ordinance or resolution, with respect to any limited access highway under their respective jurisdictions prohibit the use of any such highway by funeral processions, or by parades, pedestrians, bicycles or other nonmotorized traffic, or by any person operating a motor-driven cycle. Bicyclists may use the right shoulder of limited-access highways except where prohibited. The department of transportation may by order, and local authorities may by ordinance or resolution, with respect to any limited-access highway under their respective jurisdictions prohibit the use of the shoulders of any such highway by bicycles within urban areas or upon other sections of the highway where such use is deemed to be unsafe. The department of transportation or the local authority adopting any such prohibitory regulation shall erect and maintain official traffic control devices on the limited access roadway on which such regulations are applicable, and when so erected no person may disobey the restrictions stated on such devices. The state department of transportation and the local authorities are authorized to reserve all or any portion of any highway under their respective jurisdictions, including any designated lane or ramp, for the exclusive or preferential use of one or more of the following: (a) Public transportation vehicles; (b) motorcycles; (c) private motor vehicles carrying no fewer than a specified number of passengers; or (d) the following private transportation provider vehicles if the vehicle has the capacity to carry eight or more passengers, regardless of the number of passengers in the vehicle, and if such use does not interfere with the efficiency, reliability, and safety of public transportation operations: (i) Auto transportation company vehicles regulated under chapter 81.68 RCW; (ii) passenger charter carrier vehicles regulated under chapter81.70 RCW, except marked or unmarked stretch limousines and stretch sport utility vehicles as defined under department of licensing rules; (iii) private nonprofit transportation provider vehicles regulated under chapter 81.66 RCW; and (iv) private employer transportation service vehicles, when such limitation will increase the efficient utilization of the highway or will aid in the conservation of energy resources. Any transit-only lanes that allow other vehicles to access abutting businesses that are authorized pursuant to subsection (1) of this section may not be authorized for the use of private transportation provider vehicles as described under subsection (1) of this section. The state department of transportation and the local authorities authorized to reserve all or any portion of any highway under their respective jurisdictions, for exclusive or preferential use, may prohibit the use of a high occupancy vehicle lane by the following private transportation provider vehicles: (a) Auto transportation company vehicles regulated under chapter 81.68 RCW; (b) passenger charter carrier vehicles regulated under chapter 81.70 RCW, and marked or unmarked limousines and stretch sport utility vehicles as defined under department of licensing rules; (c) private nonprofit transportation provider vehicles regulated under chapter 81.66 RCW; and (d) private employer transportation service vehicles, when the average transit speed in the high occupancy vehicle lane fails to meet department of transportation standards and falls below forty-five miles per hour at least ninety percent of the time during the peak hours, as determined by the department of transportation or the local authority, whichever operates the facility. Regulations authorizing such exclusive or preferential use of a highway facility may be declared to be effective at all times or at specified times of day or on specified days. Violation of a restriction of highway usage prescribed by the appropriate authority under this section is a traffic infraction. Local authorities are encouraged to establish a process for private transportation providers, as described under subsections (1) and (3) of this section, to apply for the use of public transportation facilities reserved for the exclusive or preferential use of public transportation vehicles. The application and review processes should be uniform and should provide for an expeditious response by the local authority. Whenever practicable, local authorities should enter into agreements with such private transportation providers to allow for the reasonable use of these facilities. For the purposes of this section, “private employer transportation service” means regularly scheduled, fixed-route transportation service that is similarly marked or identified to display the business name or logo on the driver and passenger sides of the vehicle, meets the annual certification requirements of the department of transportation, and is offered by an employer for the benefit of its employees.